Forget the trendy utensils and the all-singing, all-dancing gadgets; all you need to be a half-decent cook is a good set of knives. Ask any professional chef what they think is the most important utensil in the kitchen and most of them will say their favourite knife, without pausing for breath. While the salad spinner and the electric can opener lay unloved and unused in some hard-to-reach cupboard, kitchen knives will be used for practically every meal you make. What Knives Do You Need? This is your all-rounder and can be used for chopping vegetables and meat and for cutting your sarnies into nice neat triangles. It will usually have a serrated blade. You use this one for more intricate cutting and slicing - for smaller vegetables and fruit. This is larger than the general-purpose knife. It can be used for all chopping and cutting and the wide blade makes it perfect for those celebrity chef garlic-crushing moments. Cook's knives are available in different sizes so it just depends what you think you'll be mainly using it for. This one is pretty self-explanatory. It's essential for cutting bread to make doorstep sandwiches. The long, serrated blade makes short work of thick crusts. A large knife designed to cut meat so probably not essential in a vegetarian kitchen. If you're partial to a Sunday roast then definitely add this one to your wish-list. 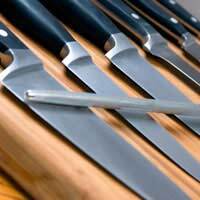 Once you've decided which knives are going to be most useful for your kitchen, you then need to choose the style. Wooden, steel or plastic handle? A matching set or individual knives? A lot of these decisions will come down to personal taste. However, you shouldn't just go on appearance; try the knives out before you buy them, they should feel comfortable in your hand and easy to manoeuvre. Don't go for anything that's too big or heavy to use easily. The whole idea is that your knives should help you and you definitely don't want to suffer any injuries from trying to chop a tomato with a knife that requires two hands to lift it. If you look after your knives you'll find cooking a much more pleasurable experience. If a knife cuts through an ingredient efficiently every time, you can prepare food much more quickly. Whilst good-quality knives should really be sharpened every few months, this probably isn't going to be realistic for a student household - unless you're training to be a chef! However, you can do small things such as keeping your knives clean and dry; investing in a sharpener for the kitchen and only using the knives for the purpose they're designed. The best thing you can do is to invest in one or two really decent knives.